There are many ways to cleanse the lymphatic system – which helps to purify bodily fluids and improve overall health. Though one of the best ways to achieve this is super easy and doesn’t even cost a dime – simply engage in a 20-30 minute vigorous walk. Because the lymphatic system has no pump, it is necessary for each individual to maintain a regular amount of activity that will serve to move the lymph. While the circulatory system relies on the heart to move the blood 24/7, the lymphatic system relies on body movement, especially walking. Within the East Indian healing schools of Ayurveda, it is well known that walking each day is a vital health practice. It is also understood that no other exercise so thoroughly circulates the lymph as does a good 20 to 30 minute aerobic walk. When performed in the clean fresh air of nature, this simple exercise can produce other health benefits as well. As a matter of not-so-well-known fact, the closer one lives to the beach or the mountains, the more the air is saturated with negative ions. Therefore, a walk on the seashore or up the mountain side not only works the calves, it also delivers healthful negative ions as opposed to the positive ion-saturated air that is often found in the cities and suburbs. What is the best walking technique which maximizes lymphatic drainage and circulation? “When you walk at a brisk pace your legs provide a natural pumping action which serves to move the lymph through the lymphatic system. This is significant because the lymphatic system has no pump as the circulatory system has a heart to pump blood. Therefore, we understand that the upper half of the body also requires some assistance. When using your daily walk as a necessary healing practice, there is certainly no reason for being self conscious. That happens to be the primary reason — self consciousness — why people walk so stiff-armed and refuse to swing their arms. 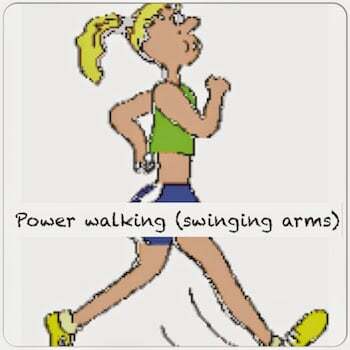 Remember, the more swinging action of your arms during your power walk, the more the upper body will undergo its lymph cleanse. Many devout practitioners have even taken to walking at night or in a secluded area where they can really bounce up and down the trails like a gorilla completely oblivious to being seen. After their arm-swinging workout, they instantly feel the buzz which comes with such a thorough and invigorating exercise session. It does appear that the human body was designed so that its proper upkeep and maintenance could be performed easily and quickly. Because of the sedentary lifestyles of so many Western societies, walking seems to be neglected more and more. With the proliferation of information technology, this trend appears to be strengthening. Therefore, it often takes more initiative to get out of the chair and into the back yard or over to the local park. If more people really knew what was at stake, they would never miss their daily walk. Likewise, if they ever experienced the release of endorphins which can accompany a hard-charging, arm-swinging power walk, they would be less inclined to skip it. and for those who can’t walk or run? Any type of activity that will squeeze the lymphatic system will most likely give similar results. Look how great people feel with Yoga. That is stretching, holding, focusing, bending, etc. If you cant walk or run then do what you can to get your body moving in some way if you are physically able. Good luck to you.